It’s not easy to take the life of an adult and turn it into a story children can relate to. Markel has excelled in this task. 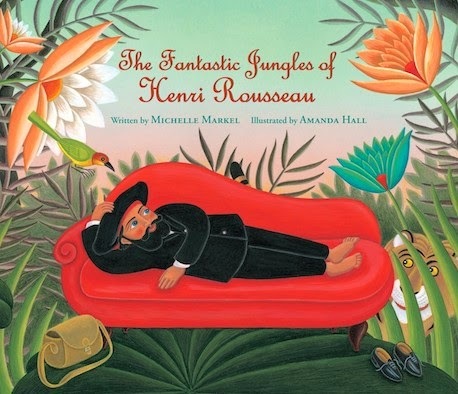 Her research into Rousseau’s life is obvious, but she has brought the facts to life for kids, telling the poignant tale in words they will understand. Her choice of present tense gives the story immediacy and puts the reader right alongside Henri as he perseveres with his ambition to become an artist. Hall’s illustrations have been done in a Rousseau style. It works very well - not an imitation but an attempt to capture the artist’s way of viewing the world. Children I’m sure will respond to the playfulness, the colour and texture in her art work. It truly is a perfect complement to Markel’s writing. It goes without saying that this book would make an excellent supplement to a home or library's resources on art. It’s also wonderful to find such an accessible biography in picture book format. But I would recommend it too because of the inspiring story of a man who was ridiculed, treated with contempt even, yet persevered and followed his dream. Our children need heroes, and Rousseau was a true hero. Why not make The Fantastic Jungles of Henri Rousseau the jumping off point for a family or class visit to a nearby art gallery? Helping children to discover and explore art is something that feeds their imaginations and encourages them to create art of their own. For further inspiration, there’s a discussion guide available at the publisher's website, and you can get more of an idea of the book via this video.